Interested in learning more about the sport of adventure racing? Thinking about competing someday? Want to be part of an exhilarating experience? Join us as a volunteer! A critical element of staging a successful adventure race is a dedicated team of volunteers on-site during the event. 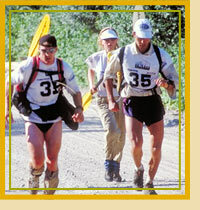 These individuals are a much needed source of information for support crews and competitors out on the course, as well as the reassuring and welcoming faces that teams first encounter when they arrive at a checkpoint or cross the finish line. Simply stated, we couldn't do it without you! There are a variety of volunteer opportunities available at all our races. CLICK HERE for this season's schedule of races across Canada. Although we cannot cover the costs of getting you to the race, once you are there we will provide you with as much as possible. Volunteering can be quite demanding, therefore we cannot promise you a lot of sleep, but we can promise you an exciting experience, the opportunity to make new friends and create memories that will last a lifetime.